The Perseus-Pisces supercluster is the most obvious supercluster in the sky. Although, like all superclusters, it is much too faint to be seen with the naked eye, this plot of bright galaxies in this region of the sky (from the Principal Galaxies Catalogue) shows how prominant it is. The Perseus-Pisces supercluster is a long, dense wall of galaxies with a length of almost 300 million light years. At the left end of the supercluster lies the massive Perseus cluster (A426), one of the most massive clusters of galaxies within 500 million light years. Below are the major clusters in the Perseus-Pisces supercluster as listed in the Abell catalogue. A426 is the most important of these clusters and was given a richness class of 2, which means it is a very rich cluster of galaxies. A262 is also a fairly rich cluster although it only received a richness class of 0. Below are some of the other major groups of galaxies in the Perseus-Pisces supercluster. Several of these groups are quite big, especially the NGC 383 group and the NGC 507 group which are both known as the Pisces cluster. There are also some groups of galaxies around the Pegasus cluster which is part of a much smaller supercluster slightly detached from the Perseus-Pisces supercluster. Column 1: The name/number of the cluster or group. Column 4: The redshift of the cluster. Column 5: The distance in millions of light years assuming H=70km/s/Mpc. Column 6: The 'richness' class of the cluster (for Abell clusters only). Column 7: Additional names and notes. Geller M, Huchra J, (1983), Groups of Galaxies. III. The CfA Survey. Astrophys J Supp, 52, 61. Not only is the Perseus-Pisces supercluster the most obvious supercluster in the sky but it also lies next to the most obvious void in the sky. The Taurus void is a large circular void bounded by walls of galaxies on either side of it. The void has a diameter of about 100 million light years. Most of the galaxies plotted in the area of the void are background galaxies that lie behind the void. Below: There are a few galaxies within the void. 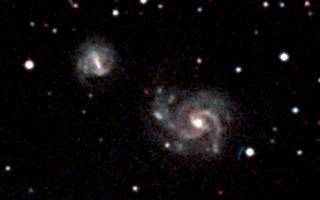 This is a picture of UGC2627 (at RA=03h17m, Dec=31°34') and its smaller companion galaxy UGC2629. These two galaxies are 185 million light years away in the northern half of the void. The Perseus cluster is the second nearest of the really rich clusters of galaxies which contain thousands of galaxies. The nearest - A3627 - is almost hidden by the plane of our galaxy and is not easy to observe. This picture below shows the central part of the Perseus cluster. The two brightest galaxies at the centre of this cluster are NGC1272 (right) and NGC1275 (left). The Perseus cluster is also fairly close to the plane of the Milky Way, so a lot of the faintest points of light in this image are actually foreground stars in our own galaxy. Right: This is a map of the Perseus cluster. This map shows the positions of 122 of the brightest galaxies in the central 1 degree area of this cluster. 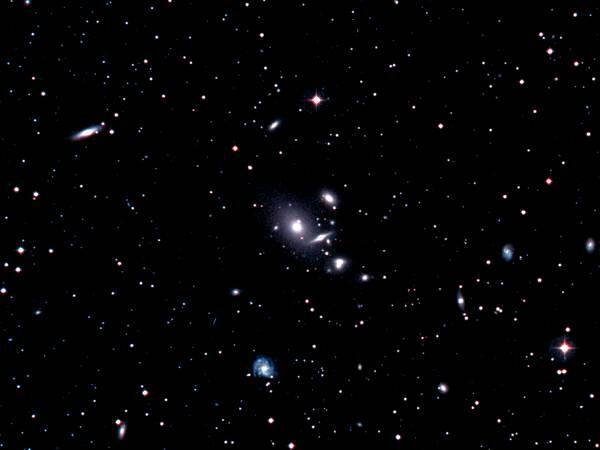 Although it is dominated by large elliptical and lenticular galaxies, the Perseus cluster also contains a lot of spiral galaxies unlike the Coma cluster. The Perseus-Pisces supercluster was one of the first superclusters discovered. It has played a very important role in the study of the large scale structure of the universe. At a conference in Tallinn in Estonia in 1977, Mihkel Jõeveer and Jaan Einasto asked Has the universe the cell structure?. They suggested that the universe consists of large superclusters of galaxies surrounding large empty voids. Although there was considerable scepticism they were subsequently proved to be correct. Their paper contains a map of the Perseus-Pisces Supercluster, showing the same region of the sky as the map at the top of this page. They produced a longer paper with Erik Tago in November 1978. The study of the Perseus-Pisces supercluster was revolutionised by the efforts of Riccardo Giovanelli and Martha Haynes. After an initial examination of the supercluster in 1983 (published with Guido Chincarini), they began a systematic study of the Perseus-Pisces supercluster in a series of 6 papers (1, 2, 3, 4, 5, 6), published between 1985 and 1993. It is largely because of their efforts that the Perseus-Pisces supercluster is now one of the best understood superclusters. 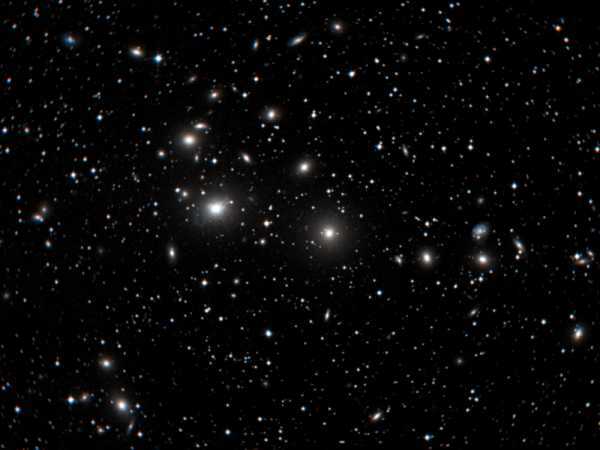 The Perseus cluster (A426) has been studied for many decades. J Brunzendorf and H Meusinger, for example, produced a major catalogue of Perseus cluster galaxies in 1999. (I used their catalogue to make the above map of the Perseus cluster). The Perseus cluster has been extensively studied at radio and X-ray wavelengths. The large elliptical galaxy NGC 1275 is a strong source of radio waves as mentioned by P Leslie and B Elsmore in a paper published in 1961. NGC 1275 is also a powerful source of X-rays. A typical X-ray contour map of the Perseus cluster (published by Branduardi-Raymont, Fabricant, Feigelson, Gorenstein, Grindlay, Soltan and Zamorani in a paper in 1981) can be seen here. The other clusters in the Perseus-Pisces supercluster are also occasionally studied. For example, S Sakai, R Giovanelli and G Wegner published a study of A262 and the NGC383 and NGC507 groups in 1994. Above - a picture of the middle of the A262 cluster. This is another of the rich clusters of galaxies in the Perseus-Pisces supercluster. The giant elliptical galaxy in the middle is NGC 708.